The solvent evaporator removes solvent from the miscella after extraction has taken place. The tubes in the solvent evaporator are fabricated with stainless steel, allowing an ideal surface for heat-exchange. Durability is also improved. By using micro-vacuum evaporation technology in the solvent evaporation system not only saves on the consumption of steam but also improves the color and quality of crude oil. 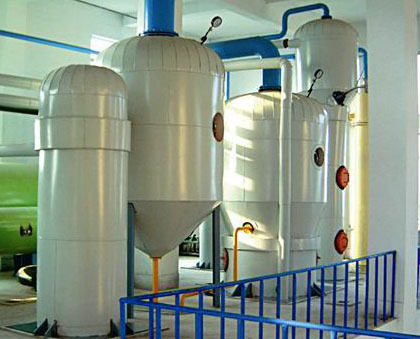 Evaporation allows for the utilization of residual heat and secondary steam. Waste steam is recycled into the first stage evaporator, curtailing its consumption by 30 percent. Miscella at the first stage solvent evaporator is heated by high temperature oil coming from the oil stripper, thereby significantly increasing the temperature of miscella going to the second stage solvent evaporator for reduced energy consumption. The miscella is evaporated at a low temperature. Residual solvent is reduced giving the crude oil a light color. Stainless Steel multi-tube condensers have allowed higher rates of solvent recovery and a reduced workspace, lowering production costs and the initial investment. The vapor contactor has reduced the load on the DT condenser and increased the temperature of the solvent. The boiler tank minimizes the solvent residue in the waste water.